I met Chef Hugh Acheson years ago and was a fan even before that. He's devilishly handsome, intelligent, charming, seemingly a little mischievous, but in a fun way, and even a little quirky...that's to say he's unique among chefs of such an exalted caliber. Okay, okay, maybe I am a super-fan. He's really just a totally cool, laid back, fun human being. 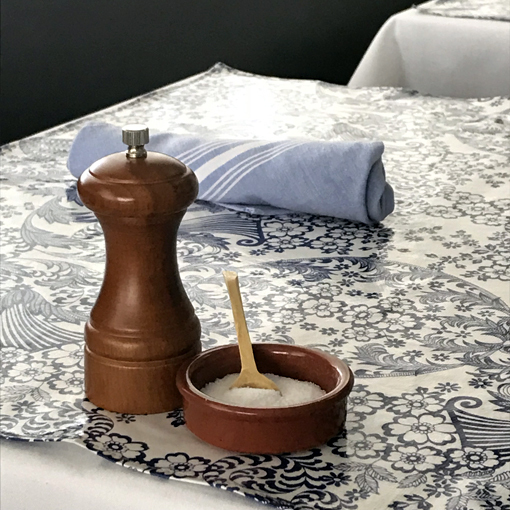 I have the honor of sharing with you an interview with Chef Hugh in conjunction with a visit to one of his restaurants in Athens, The National. My visit to The National was with my friend Wayne, the State Parks aficionado I've mentioned before. Our single-day excursions are typically multi-adventures. On this particular day we started at The National, then went to Watson Mill Bridge State Park and then to see the mysterious Georgia Guidestones. Hugh's interview answers are brief, but insightful and hilarious, much like his Instagram posts. If you're not following Chef Hugh on Instagram, you totally must! wanderlust ATLANTA: I've been a Chef Hugh Acheson fan for years. Please share with my readers who you are. Chef Hugh: I am a chef from Canada who has lived in Athens, Georgia, for more than 20 years. I write cookbooks and run restaurants. 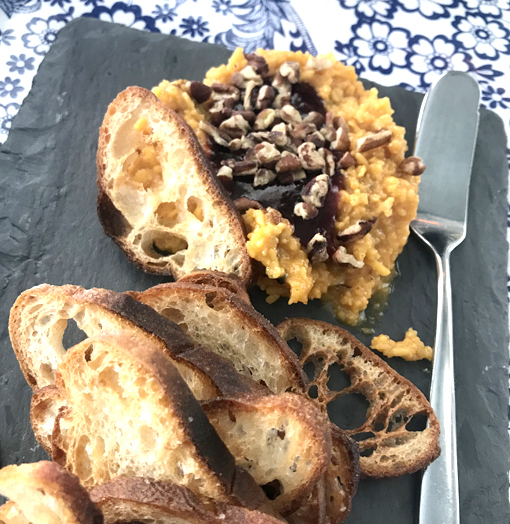 We selected The National because Hugh's other Athens restaurant, 5&10, isn't open for lunch on Saturdays, but it's his flagship restaurant, so I definitely want to return for a weeknight dinner or Sunday Brunch. The National is absolutely lovely. The attention to detail and the nuanced touches make for a place where you feel welcome and somewhere you want to be. Opened in 2007, it's a small—yet spacious—bistro with a Mediterranean influence. Executive Chef Peter Dale prepares a menu that nods to Northern African and Spanish cuisines. wanderlust ATLANTA: You once shared with an audience—that I was in—a little bit about how you use your sketchbook to develop recipes. Will you tell us a little about that process, please? Chef Hugh: I like to doodle and take notes. To me, nothing replaces pen and paper. I draw plates and dishes that I am working on, take notes on places I travel to, and make lists of things to look into and research. It is just the way I catalog life. Quite refreshing, this restaurant offers an array of house-made sodas, refreshers and shrubs, the kind you're not going to find anywhere else. 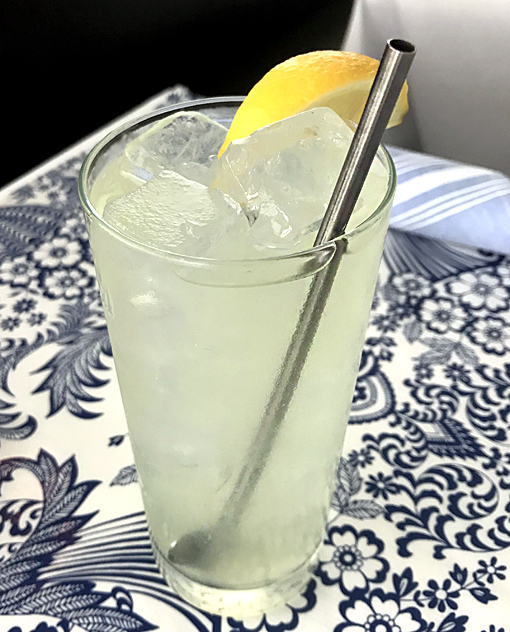 Wayne had their house-made Lemonade, and you can see that they're sustainability-minded using metal straws instead of plastic. Kudos! I had a Sauvignon Blanc that was quite refreshing, light and crisp, just the way I like them. The beverage menu is impressive and varied, but not so long that you're doubly parched by time you peruse the choices. wanderlust ATLANTA: I recently dined at The National with a friend. We enjoyed multiple courses and LOVED everything! The menu is ever-new, so what's a can't-miss experience here? Chef Hugh: The National's hummus with ground lamb is a pretty special and comforting plate of food. And all of their drinks are pretty amazing. Okay, next time I go to The National, I'm definitely trying the Hummus with Lamb. I lived in Greece for more than two years and fell eternally in love with Mediterranean cuisine. All of it. Especially hummus, calamari and tzatziki! 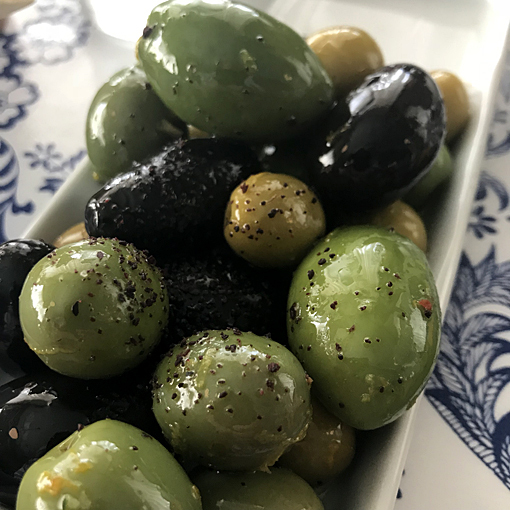 We enjoyed a couple of appetizers, starting with the Marinated Olives—told you I love Mediterranean! They were delicious and poor Wayne hardly had any. I devoured, minding my manners of course, most of them. Chef Hugh: I hang out with my kids and watch Wheel of Fortune. No joke. We also enjoyed an appetizer they were calling Rosalynn Carter Cheese Ring. It's akin to pimento cheese, but not. It's topped with strawberry jam and pecans and is offered with toasts on the side. Quite good, definitely a unique experience in taste and texture. I love such adventures, especially when they're good! wanderlust ATLANTA: You are, without question, a celebrity chef. What advice would you give an ambitious culinarian who wants to achieve celebrity status? Chef Hugh: The term celebrity is something I avoid. I am just trying to be me. Wayne had the soup of the day which I got to taste. It was a Cucumber Gazpacho! 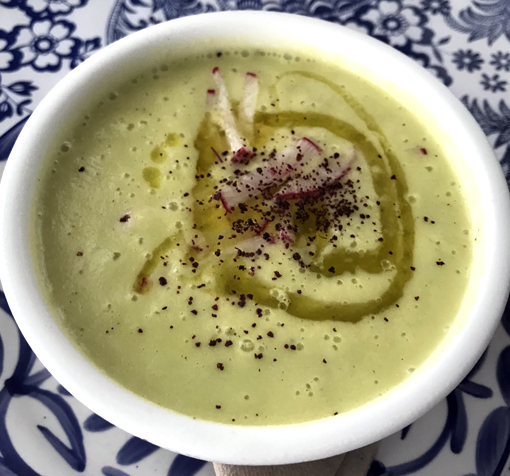 I love cold soups (hot soups, too) and this one is a star! It had radish, sumac, and olive oil and it was delicious...perfect before our day of 90°-plus outdoor adventures! I love to cook and came very close to going to culinary school, but I didn't want to give up my nights and weekends. That was decades ago. Today I revel in the delights of what today's ultra creative chefs put on their menus. I started collecting autographed books in 2002, but only ones when I'm there to get the autograph myself. The first was Leonard Nimoy's first photography book. From there I was hooked. Not too long after that I got Alton Brown to autograph his book Good Eats, based on his crazy-popular TV show of the same name. 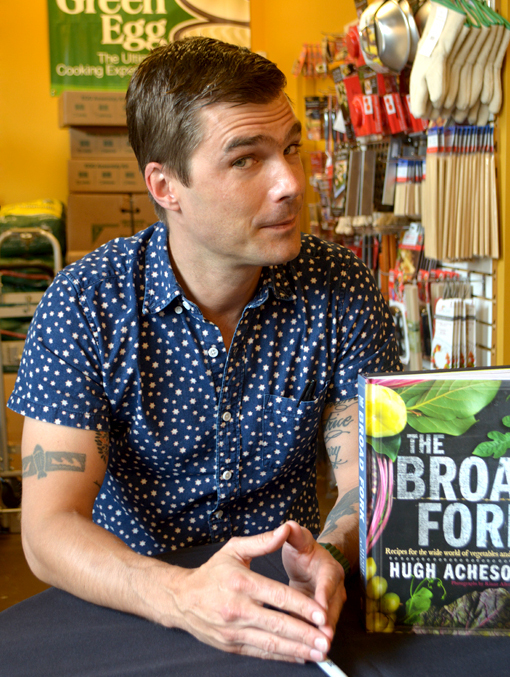 Since then, my autographed cookbook collection has grown extensively and includes Chef -Hugh Acheson's The Broad Fork. That one if highly focused on fresh vegetables and be sure to check out his other cookbooks. wanderlust ATLANTA: What's your favorite food from childhood and why? Did you eat your veggies? Chef Hugh: I was a strange kid who didn't like mac & cheese and hamburgers. I loved vegetables. Still do. 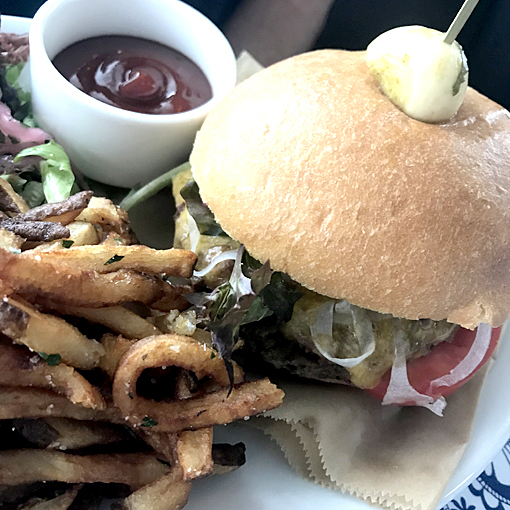 Wayne had the Impossible Burger, billed as "the meatiest veggie burger around". With its shaved Vidalia onion and pomegranate ketchup, it sounds amazing! And who doesn't love a brioche bun?! 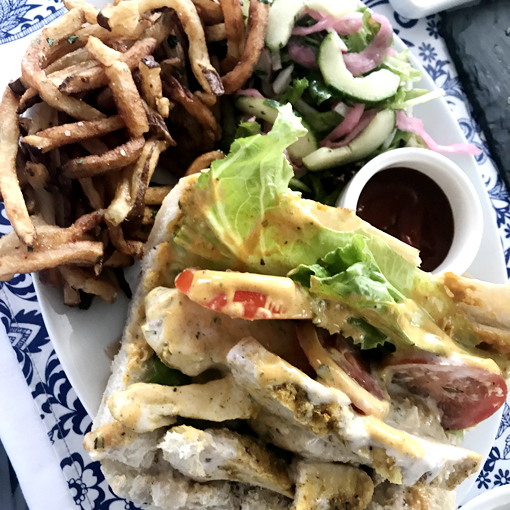 The fries, which we both enjoyed with our entrees, are so amazing, you'll be at least halfway through them before you remember that you have other items on your plate! So many restaurants ignore humans' love of french fries and under-deliver—there are way too many places that do that, what a miss—but The National, Chef Peter in particular, should be in the French Fry Hall of Fame! I don't think there is one, but these fries should at the very least be immortalized in the French Fry Museum! wanderlust ATLANTA: What's your favorite kitchen gadget and why? Chef Hugh: A serving spoon. It is my spatula, my scoop, my ladle. It is the OG multi-tool. I opted for the Hancock Hoagie, presumably named for the restaurant's street, and was delighted with my choice! It's billed as "a little messy, but totally worth it." And it was! This "creation" has curry-rubbed chicken breast, lettuce, tomato, sweet and tangy curry sauce, and Italian dressing. I could bath in this stuff! Not at the restaurant—minding my manners, remember—it's that delicious! One thing that stood out for me, and that makes me love this restaurant, is that it uses a lot of spices that perhaps not everyone has in their cupboard, but they're spices that everyone could find at their local markets. If you like a dish you enjoyed at The National, it's something you could try to recreate at home, but I for one will want to return for the real thing. wanderlust ATLANTA: You autographed a copy of your cookbook The Broad Fork for me about a year ago and I'm loving it! What was unique about writing that book compared to others you've written? Chef Hugh: The Broad Fork was meant show to cooking methods for pretty much all vegetables. It was meant to answer the age old question, "What do you do with kohlrabi?". It was fun to write. When you walk into The National, directly in front of you is the bar—a handsomely and uniquely appointed bar. The dining room is to your right. So, you can come in for drinks or come in for dinner or come in early and enjoy drinks before you have dinner. Mix it up, have some fun! I love the travel theme decor. 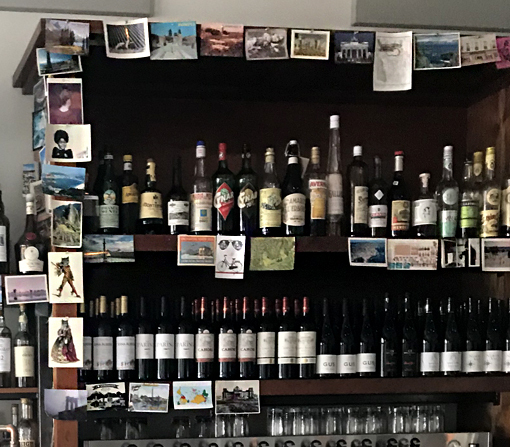 There are postcards from all over the world taped up behind the bar and there's a vintage lunch box with a flight crew standing in front of an airplane with "The National" painted on its fuselage. The lunchbox has no connection to the restaurant which makes it even more fun. When I travel, I want to explore the local scene and cuisine. If I'm in a new city—or even my own for that matter—I'm not going to go to a chain that I can find anywhere, I'm going to ask around and check out the most talked about place in town or that only-the-locals-know place. That practice promises an adventure every time! Eat local and save the chains for when you're home...that's just my personal advice. wanderlust ATLANTA: You travel a lot...a LOT! From a chef's perspective, what are the best and worst things about traveling. Favorite destination? Chef Hugh: Traveling is critical to understanding the world. It can be exhausting sometimes, but you just need to remember to drink a lot of water and pack smartly. Going through cobblestone streets in Lisbon with a roller hard suitcase is silly. Get a backpack. But do go to Lisbon. It is stunning. 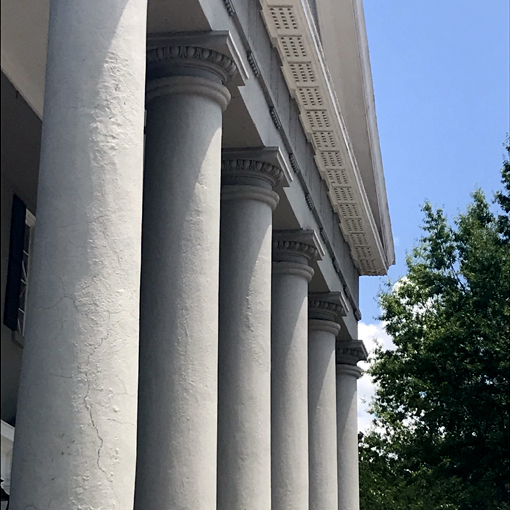 While you're in Athens, explore this fantastic city known for its music scene, sports and awesome restaurants.There's lots to do here! When you get back to Atlanta, check out Chef Hugh's other restaurants, Spiller Park (2015) at Ponce City Market and Toco Hills; named for his grandfather, Achie's (2018) at the Omni Hotel at Battery Atlanta; and the most talked about Empire State South (2010) in the heart of Midtown. wanderlust ATLANTA: What's next for Chef Hugh Acheson? Chef Hugh: Lots. Food is an endless topic to explore. I'd like to offer a huge wanderlust ATLANTA "Thank you!" to Chef Hugh, the staff at The National and to PR firm Baltz & Company for arranging the interview. This was not a sponsored post nor a sponsored restaurant visit. All opinions are my own. Now, go experience the bliss of Chef Hugh Acheson's restaurants! The new 'Fox Theatre Ghost Tour' has Personality!